A gleaming beacon of silver and blue in a town filled with black and orange, Patriots Nation - 'Nati is a chance for real Pats fans to get together for games, networking, meeting new friends, and having fun. GO PATS! Be SURE to contact us via email or our Facebook page to connect with our community - and find out what's happening with Pats @ Bengals in 2019! Fun, friends, and a good time. 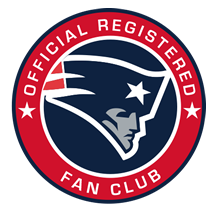 Be SURE to contact us via email or our Facebook page to connect with our community - and find out what's happening with Pats @ Bengals in 2019!